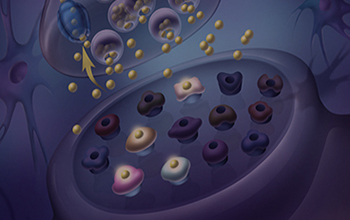 I was contacted by the CEO of a marketing communications agency to create a series of four medical illustrations for her client, a startup biotech company that was developing a drug to treat anxiety and depression. The images would be aimed at investors and scientists and would be used primarily in PowerPoint presentations and in an initial public offering. 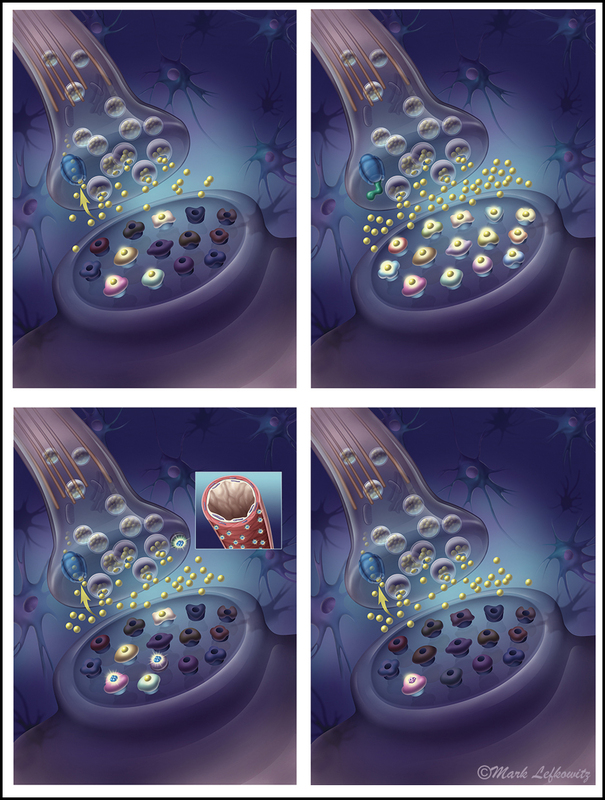 The images would focus on comparing the abnormal regulation of the neurotransmitter 5-HT (serotonin) with the mechanism of action of drugs currently used to treat anxiety and depression, and specifically highlight the superior receptor selectivity of the company’s own drug candidate. taking the company’s highly selective 5-HT1A agonist. After an initial phone call with members of the marketing communications agency, my meetings and conference calls were with high-level scientists at the client biotech company. I needed a clear understanding of the science behind their research so that I could begin to create initial concept sketches. As we discussed various approaches for depicting receptor activation in the four patient scenarios, I decided that each specific class of receptors would be best represented by a different shape and color. I used a relatively dark, cool palette for the base images, and a glass-like transparent effect for the pre- and postysynaptic elements. The team endorsed this approach, and agreed that creating a bright, warm glow at the receptors’ activation site would dramatically highlight the differences among the four scenarios. When the project was completed, the CEO of the agency and the research team of the biotech company provided very positive feedback. Their audiences were able to review and compare each scenario so that the mechanism of action of the company’s drug candidate could be clearly understood. At the beginning of any project, I love hearing “this subject matter simply can’t be explained visually; it’s much too complex”. I relish the challenge of creating imagery which distills the key elements of a story into clear and understandable imagery.